Railsware is a company that deals with numerous tasks and ideas associated with web and mobile development. Our engineers always seek the best solution for optimization of both performance and budgeting. The core vision of Railswarians is a lean approach. In this overview, we are going to review a development of a feature of geolocation search around user’s current location. React Native was chosen as the framework for building a single application for both the most popular operating systems in the market, namely iOS and Android. The backend part was put into effect through Rails as a web framework and PostgreSQL as a database. Are you ready to learn details and peculiarities of using such an approach for mobile app development? You are welcome to read our experience. Let’s begin our publication with the core points related to frontend development. So, using React Native is opening the case. 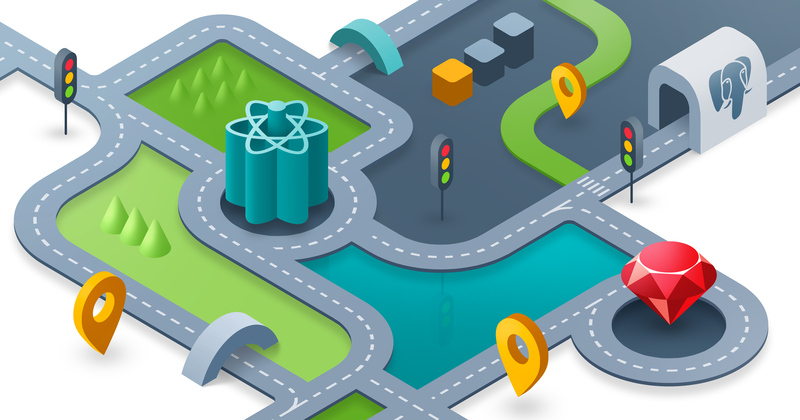 The React Native Geolocation API extends the Geolocation web specs and is available globally through the navigator.geolocation. In order to display maps, the react-native-maps package was used. Although this solution is imperfect due to multiple bugs and lack of documentation to cope with them, it provides a set of features we need to display information on maps. Moreover, it works on both iOS and Android at the same time. We used a default setup where both mobile operating systems render their own maps: Apple Maps on iOS and Google Maps on Android. showsUserLocation property is used to show natively user location. initialRegion displays the initial region on the map. style is basically set to be positioned absolute and fill the entire screen. A complete API description of MapView component can be found in the following documentation. The list of places to render on the map pass as props to this component (it comes from the redux state but we skipped this part here). image – to specify a contone image to be shown as a marker. That’s it for the frontend. Let’s take a look at the backend now. We’ll put aside React Native and focus on other tools we used. Rails was chosen as a web framework to build API for mobile applications and PostgreSQL – as a database. The latter draws our special attention. PostGIS that is a spatial database extender for PostgreSQL database was used to search places within an area. The extender adds support for geographic objects enabling the user to run location queries in SQL. PostGIS provides the ST_DWithin spatial function, which was used to check whether places are located within the specified distance from the current user location passed to the scope. The above-described issues should be the bullet points to consider in projects dealing with embedding a geolocation search feature. Certainly, it refers to using React Native as a frontend technology, and Rails plus PostgreSQL as tools to build the backend part. The mentioned technologies proved their efficiency and practicability for such type projects.